FILE / Former Wolf adviser John HangerÕs medical marijuana company had attempted to sell its permit for $20 million. A politically connected medical marijuana grower has suspended its effort to sell itself for $20 million after the Wolf administration threatened to revoke its cultivation permit. The Inquirer first reported Oct. 3 that Franklin Labs LLC — chaired by Gov. 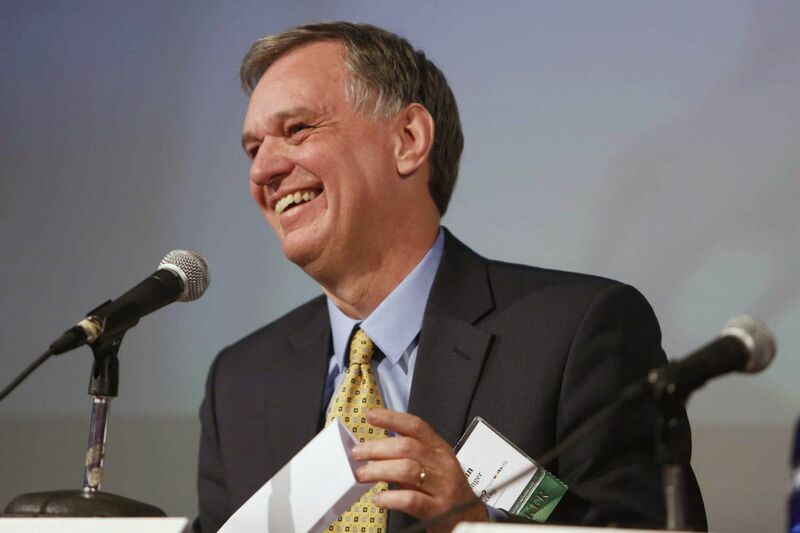 Wolf's former adviser John Hanger — was circulating a confidential prospectus soliciting bids for the company, its permit, and its 47,000-foot grow house in Reading, possibly violating state law. In a sternly worded warning letter dated Oct. 13, John Collins, director of the state Office of Medical Marijuana, called the offer "disturbing … especially in light of the fact that Franklin Labs is not yet operational as a grower/processor facility." On Monday, the company took the offer off the table and drew a distinction, saying it had never offered to sell its cannabis permit. Instead, it explained, it had offered to sell 100 percent of the stock in Franklin Labs, which coincidentally happens to include the permit as an asset. In a statement, Franklin Labs CEO John Pohlhaus said, "We have suspended any further discussion of the sale of stock in Franklin Labs and will work cooperatively with the Department [of Health] to resolve any outstanding issues in the matter." In his letter, Collins demanded that Franklin Labs provide copies of all drafts of the prospectus, a status report describing the company's ability to open by Dec. 20, a list of all the businesses and people who have discussed buying the permit, and all communications related to an attempted sale. Collection of such evidence can indicate investigations are underway. Franklin Labs was one of 12 companies awarded highly coveted permits in June to cultivate cannabis and process the plant's oils into medicines. By statute, the growers must commence cultivation by Christmas week. The state Department of Health intends for medical marijuana products to be available to Pennsylvania residents by early 2018. None of the marijuana permits may be sold or transferred without the approval of the Health Department, and a company may hold only one permit. John Pohlhaus, CEO of Franklin Labs LLC, in the grow room of the company’s sister facility, Garden State Dispensary in Woodbridge, N.J.
Pohlhaus previously told the Inquirer that the company expected to be awarded a special clinical research (CR) permit that would ally it with the Lake Erie College of Osteopathic Medicine (LECOM). The prospectus "was developed as a contingency plan pending final rules for clinical registrants," he said. "Those rules have not been finalized." There are eight available CR permits, one for each of the state's major health systems. None has yet been awarded. A CR would allow Franklin Labs to not only grow marijuana, it would also give it the right to open six dispensaries anywhere in the state. In addition, as a CR, Franklin Labs would collaborate with LECOM on light research into the effectiveness of certain marijuana strains on patients suffering from any of 17 qualifying conditions. Collins, in his outraged rebuke to Franklin Labs, said that the primary objective of the state's medical marijuana law is to "mitigate the suffering of the commonwealth's most vulnerable citizens — from children to veterans." "The act's primary objectives, however, do not include the financial gain of those who are in this fledgling industry. Franklin Labs' pecuniary interests and business ambition cannot — and must not — supersede the needs of those Pennsylvanians who hope that medical marijuana will alleviate the symptoms of serious medical conditions from which they and their loved ones suffer each and every day."